We work regularly in English and French, and are always eager for new challenges and experiences. 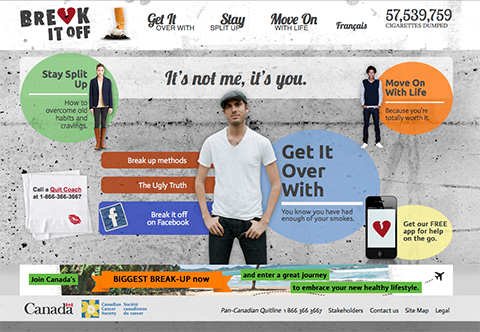 Break-It-Off website for Health Canada. Contracted through an agency to completely rework an existing WordPress-based website to meet WCAG requirements as part of its adoption by Health Canada, and to produce a French-language version of the site. The sites, www.breakitoff.ca and www.jetelaisse.ca, were originally designed for the Canadian Cancer Society and made extensive use of custom template layouts and CSS. They are smoking cessation sites intended to target young smokers and to offer information and help in quitting, including a smartphone app. WCAG (Web Content Accessibility Guidelines) accessibility and HTML5 code validation to federal government standards. Extensive customization of WordPress templates and CSS was needed to achieve this, modifying colours to ensure adequate contrast existed between backgrounds and text elements, and that all text could be enlarged up to 200% without disrupting the page layout. French-language version of the site was created once the essential changes had been approved on the English version. A PHP-based language-changer was created and added to the menus, linking what were two different domains. Annual Report for the Christmas Exchange. Annual report produced for the Christmas Exchange for the year 2009–2010. Printed by the Christmas Exchange themselves as an on-demand project, and with only a minimal budget available, the report still achieves a highly effective and professional presentation. Thanks to a good-quality colour printer capable of printing on tabloid papers, the Christmas Exchange is able to print and bind their annual report cost effectively in colour and with very reasonable quality. Our design combines selective use of bold colour with a clean and crisp presentation. Targetscores website with member login. 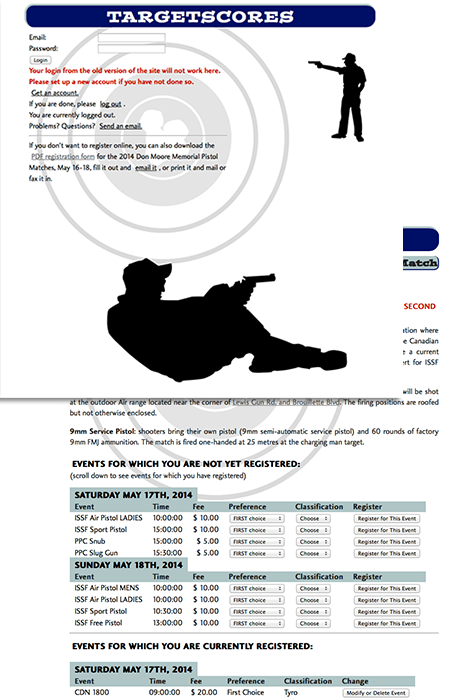 A rather unique website, created primarily for use by the NCRRA (National Capital Region Rifle Association), an enormous amount of custom PHP and MySQL coding was created in order to allow for the complete operation of target shooting matches. Using HTML5, the site was created using Dreamweaver, although almost entirely in Code view. The graphics used on the home page are done as SVG vector graphics, the newest form of standardized vector graphic becoming more widely used now. Competitors access the site using a secure login, based around a valid email address and a password hashed and encrypted that cannot be decrypted even by the site administrator. Although SSL is not used (it could be), the secure sessions created provide adequate security for its purpose. Once registered, competitors can sign up for active matches. Once they agree to terms and conditions and make a prize preference, a registration page for the match automatically presents the dates and events for the match, with events they can register for listed in chronological order at the top, and events for which they have already registered summarized similarly at the bottom. They then pick which events in the match they would like to compete in, indicate their classifications (assigned level of expertise) for each event, and see the toal fees they will have to pay. A page using CSS designed for printing presents a summary for that purpose.They can return to change or delete their events any time until the match is closed, with the registration page updating dynamically to their changes, and can review the results of previously-completed matches online. The administrative side of the site is extremely powerful. Events can be created and edited, which includes indicating the scoring system used for that event and the classifications available for that event. New matches are created, and events assigned to the match with specific dates and times, fees and so on associated with them. The administrator has the option to add competitors (those who do not register online) to matches directly, without the need for a login, and can then register them for a match. The administrator will also assign competitors to each event in the match, which confirms their place on the firing line and makes their fees due (paid fees are indicated elsewhere, too, to balance the books for the match). Once the match has been completed, administrators score the match by entering every single shot fired on every target into the database. The site automatically generates tables for this purpose, and scoring can be assigned as an administrative function on its own, without access to other administrative functions, since help is often needed for this tedious task. The totals for each target are calculated as scores are entered, for cross-checking against the scores that were recorded during the match. After scoring, winners for the events can be determined and posted in the listings for closed and completed events . The Caring and Sharing Exchange Joomla website. RPM Creative provides graphic design services for the Caring and Sharing Exchange (formerly The Christmas Exchange), both print and web, and has done since our founding. We have created three different versions of this website in that time. 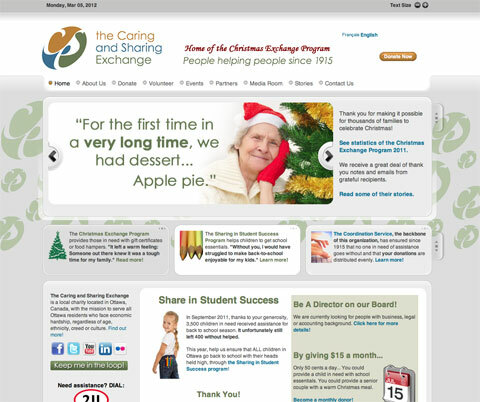 The design of the The Caring and Sharing Exchange uses the Joomla! Content Management System, a free, open source CMS based in PHP and MySQL. Remarkably sophisticated and with a vibrant community providing resources and support, Joomla! not only allows the client to do much of their own site maintenance, but the huge number and diversity of extensions available make future development into almost any possible area relatively simple and very inexpensive; usually free. This is the second Joomla!-based version of the site, the first being for The Christmas Exchange. Much more than a simple rebranding to The Caring and Sharing Exchange, this version is fully bilingual and incorporates a good assortment of multimedia content. RPM Creative sourced and recommended an initial template design from hundreds available, and then customized the look and CSS specifically for the Christmas Exchange. After setting up the menus and transferring over some content from our previous version of the site, we held a training session and provided telephone support while Christmas Exchange staff while they set up the remainder of the site themselves – an important training exercise in its own right. Joomla! extensions allow the use of customized PHP and MySQL coding within its own environment, so RPM has been able to continue to provide custom pages and functionality as needed. Joomla! Content Management System allows the client to do most of their own site content maintenance. Custom coding for forms used in e-commerce (including credit card transactions), contests, voting, event subscriptions and so on is still created on an as-needed basis and added to the site by RPM Creative. Uses the Joomfish component to create a fully bilingual site.